I wonder if you haven’t figured out by now that my love for historical fashion runs incredibly deep. Despite this, however, I hardly have any costumes to show for it, let alone any foundations. 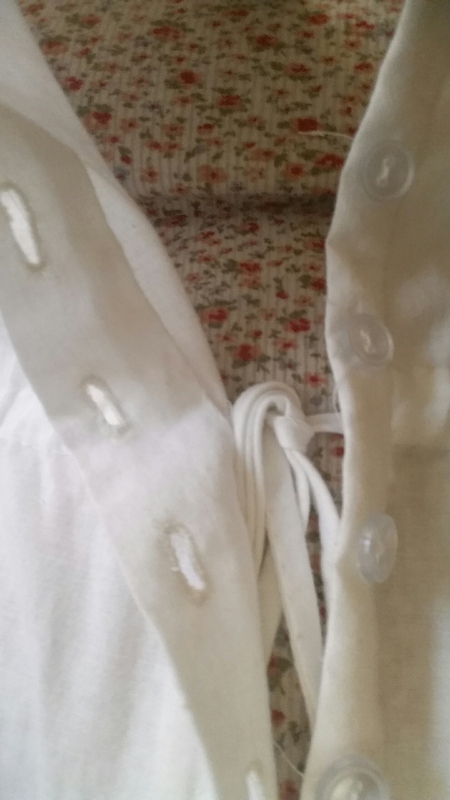 Past historical projects of mine have been firmly rooted in the uncorseted past where the foundation for a garment is mostly sewn into the garment itself in the form of stiffened interlinings. And while I enjoy these costumes for their comfort and ease, I think I’m ready to tackle the eras where my true passion lies. Eras in which women employed stays or corsets to shape their bodies. Eras that require more undergarments than just a shift. There isn’t a whole lot of history behind combinations. 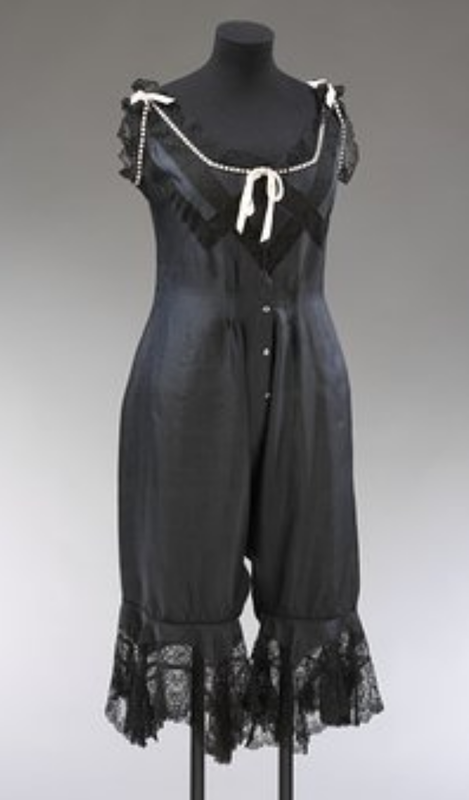 In fact, compared to other undergarments like the shift, they were only around for a blink of an eye before fashion left them behind in the very early 20s. You see, they were just the solution to a bulky problem. 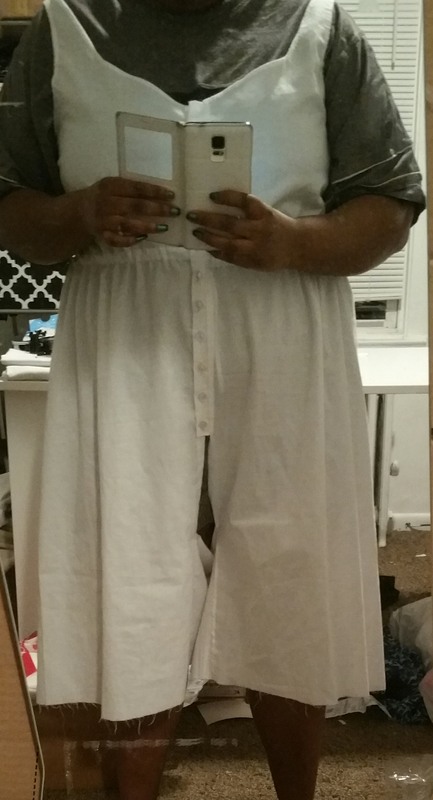 Wearing shifts and drawers together creates alot of fabric traffic around the waist. By meshing the two together, you essentially knock out two birds with one stone: less layers around your waist so you can really cinch down to achieve that pinched waist and one less article of clothing to put on. Like most shifts, drawers, and shirts during this time, they were made from readily available thin cotton, linen, or silk. Mine are made from 100% cotton muslin and cotton thread with polyester buttons. They are 100% handsewn and 98% of it was constructed while I languished, sick, on my living room couch. Seeing as though these are essentially a trial run, I did not embellish them. I still like them though. They reminds me a lot of the romper trend from a few years ago now but more convenient with a split crotch. There are commercial patterns available as well as xeroxed patterns from the pages of different ladies’ magazines but I decided to wing it. 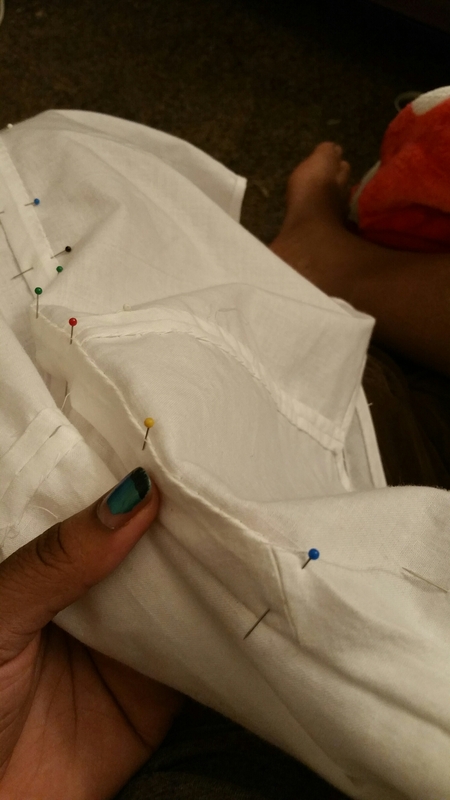 I drafted the main body but the other pieces, like the inside of the legs and button placket, were formed out of the leftover scraps. I didn’t make mine as fitted at the waist as the one pictured above. Fitting was something I couldn’t bring myself to do in between naps and coughing my lungs out. But there are plenty of examples of loosely fitted combinations during the late Victorian and early Edwardian periods. I fixed this by cutting out new inside leg pieces that were several inches longer. In the process of inserting them, I somehow made a mistake which left me with just a tiny hole in the same area. No one is going to see it anyway so I’m leaving it. I know better for next time. I added the drawstrings so that I have the ability to wear them from one era to another. Victorian combinations are more fitted through the use of darts, with narrow legs that stop at the knee or lower. Edwardian combinations, from existing extant pieces, tend to be much more loose and frilly. The legs are very wide for modesty’s sake and tend to be on the short side in comparison. Also, several pieces that I’ve seen have extra fabric at the front bodice to form the infamous ‘pigeon breast’ silhouette. All of the strips were sewn to the inside using the same method. Each strip was prepared with only one edge ironed down. 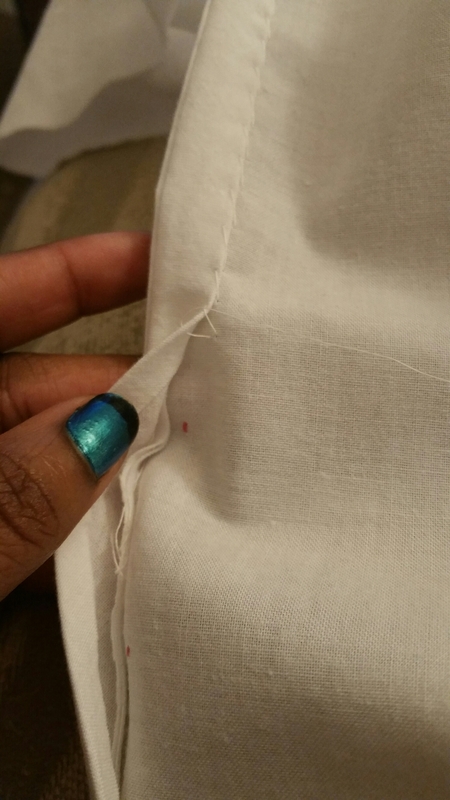 They were first sewn with the right side of the bias tape pinned to the wrong side. 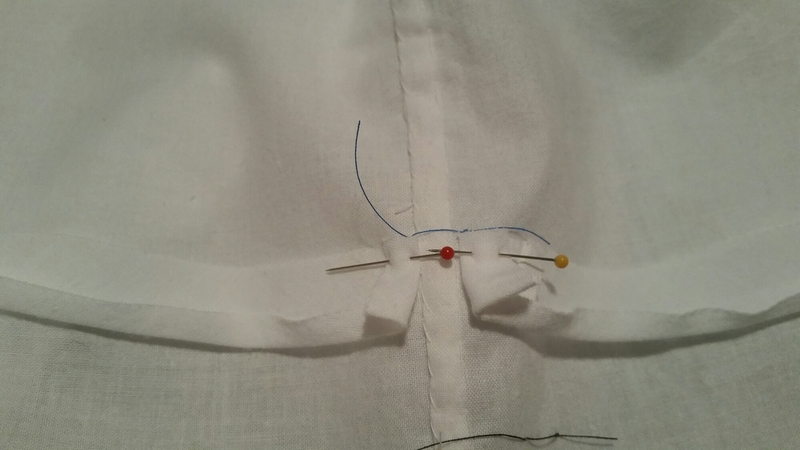 Once it was sewn down with a running pick stitch, the bias tape was folded upward, pinned down, and sewn with a whip stitch along the folded edge. Woo! Excuse the dirty mirror! This entry was posted in Uncategorized and tagged base layer, combination underwear, combinations, Edwardian foundations, Fashion Nostalgia, hand sewn, Lady Carolyn, The Victoria and Albert Museum, V&A, Victorian foundations. Bookmark the permalink.